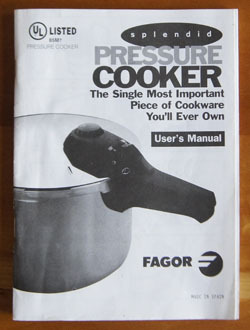 Cookbook #230: Pressure Cooker, User’s Manual, Fagor America, Inc., Lyndhurst, NJ, 1999. This is the instruction manual that came with the pressure cooker I bought sometime in the early 2000s. I have already talked about that specific pressure cooker in my post Fagor Pressure Cookers, More than 50 Recipes. I’ve used this booklet – that note is in my handwriting. 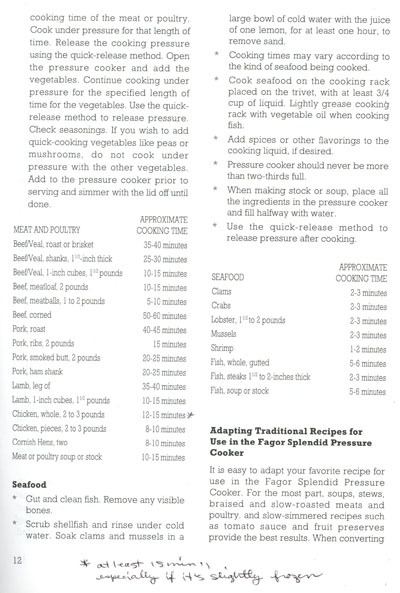 The cooking times for chicken correlate well with the times in my current electric cooker instruction booklet (Cuisinart Electric Pressure Cooker). I don’t need this booklet anymore, since I no longer have a stove-top pressure cooker and since the recipes aren’t very exciting. I will recycle it. In summary, the manual cooker instructions state to cook a whole chicken a little bit longer than chicken pieces; the electric cooker instructions state to cook a whole chicken two and a half times as long. I can see that there are several other variables to control: cut of chicken, weight of chicken, amount of liquid, amount of liquid, length of cooking, and type of pressure release. So how the heck shall I cook my odd mixture of thick chicken breasts and drumsticks? I decide to make an educated guess and do an experiment. 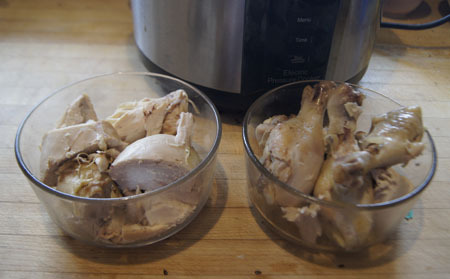 I will cook my large-sized bone-in chicken breasts and 6 drumsticks in 1/2 cup water (and a little salt) for at least 10 minutes and use the quick release. But as an experiment, I decide to check the chicken after 8 minutes. All the chicken pieces are done, but honestly, the breasts were kind of rubbery and dry. Hmmm. I poured the cooking liquid into a measuring cup – it totalled 1 cup. It seems a lot of the juices ran out of the chicken. In the future, I recommend trying more water in the pot at the start, up to 2 cups. This chicken did make a great chicken salad. Cut up and dressed with mayonnaise, it was just fine, and didn’t taste rubbery. It was also good in chicken soup (made with that cup of chicken liquid). And I have enough chicken for yet another meal too. This is an experiment in progress! For large chicken breasts, I suggest trying (first) 1-2 cups water, and 12-15 minutes (quick release) cooking time for a whole chicken. If I have a whole chicken, I’d try 16-20 minutes. I had a fun time with this – I still like doing experiments. Cookbook #185: Presto Pressure Cooker Recipe Book, National Presto Industries, Eau Claire, WI, 1970. 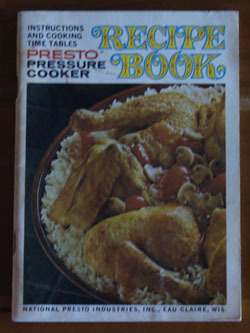 I saved this little booklet from way back in the early 1970s, when I got my first pressure cooker, a Presto. That cooker lasted until the late 1990s. It still semi-worked, but the gasket leaked and I don’t think I could find a new one. So I bought a Fagor pressure cooker, as I described in another blog post, Fagor Pressure Cookers. That pressure cooker also failed because of gasket issues. Currently, I own only an electric pressure cooker. It is a dream! I looked carefully through the Presto Pressure Cooker Recipe Book to see if there are enough good recipes in it to warrant keeping it. Only one – Savory Chicken – catches my eye. So I will recycle the booklet. I’ll get to that recipe later. As I write this, I have already made the recipe, and it was delicious! In fact, I was so impressed with my electric pressure cooker, that I have to rave about it a little. I cooked the chicken (10 minutes) and meat for a stew (16 minutes) sequentially one afternoon, for a total prep/cook time of maybe 45 minutes. Each recipe made enough for two meals. Each tasted great. Amazing. Slow cookers generally require a separate pan for the browning step. 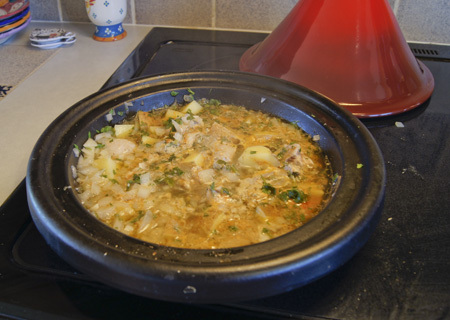 Most slow cooker recipes take 6-8 hours to cook, which can be good (you can be gone) or bad (often some ingredients in the dish are overcooked). Gravy reduction can be done right in the pot. If the slow cooker has a removable crock, it can be pretty easy to clean, especially if it fits in the dishwasher. Clay pots do not allow browning/gravy reduction in the pot (but meats cooked in them brown anyway!). Cooking time is about an hour. I find taking the very hot clay pot out of the oven difficult. Gravy must be thickened in a different pan. The pot takes an overnight soak to clean. LeCruesets allow stove top browning/gravy reduction and are easy to get out of the oven and to clean. Most recipes take a few hours in the oven (and smell delicious all the time!). Electric pressure cookers are about the best in all of the braising steps. The unit is shaped like a slow cooker, with a light weight non-stick insert (easy to clean). You brown the meats right in the unit using a “browning” setting. Then, you add all the ingredients, seal the unit with the lid, and set the timer to however long you want to cook on high (or low) pressure. It heats up, hisses briefly, then settles into the cooking time with just a tiny bit of hissing. 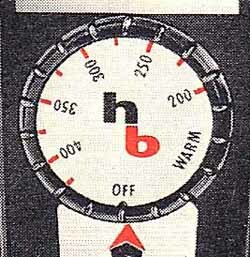 Pressure is released slowly or quickly with the release knob. If the meat isn’t done enough, or if you want to add another ingredient like potatoes that need a short cooking time, the unit quickly gets back up to pressure. After the pressure cycle you take off the lid and set to the browning cycle to reduce the pan juices. Cook times are short! 15 minutes to cook stew meat! Clean-up is very easy, a quick wash in soapy water is all the insert needs. I found a great website with a lot of recipes for electric pressure cookers: Pressure Cooking Today. I love the author’s statement on the main page – “Today’s pressure cookers aren’t the scary pressure cookers your mom used.” That’s exactly how I felt about my manual pressure cookers! 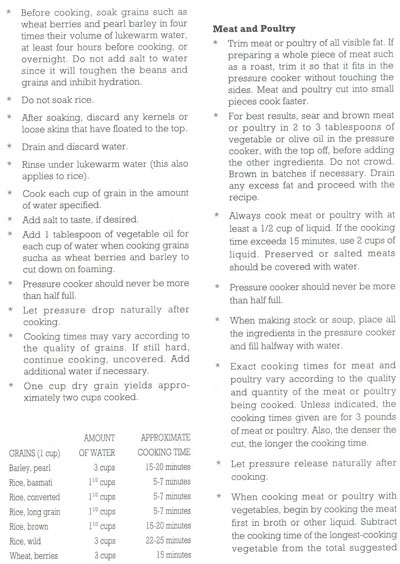 Here is the recipe for Savory Chicken, as printed in Presto Pressure Cooker Recipe Book. 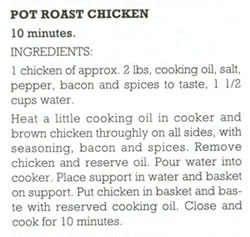 The version of this recipe, below, is my adaptaion of Savory Chicken for my electric pressure cooker. Heat the oil in a pressure cooker set to “brown”. Add the chicken pieces and brown all sides. Add the paprika, onion, carrot, tomatoes, and salt and pepper. Cover and seal the pressure cooker. Set to high pressure, 10 minutes. Start the cycle. This tasted great! I served it over rice, but noodles would work well too. The chicken was juicy and tender and very flavorful. Cookbook #113: Hamilton Beach Automatic Heat Control Appliances, Hamilton Beach, Racine, Wisconsin, Division of Scovill Manufacturing Company, circa 1970 (no date in booklet). I found my old electric fry pan while organizing my cooking stuff in the basement. I wavered between putting it on the “definitely toss” or the “maybe recycle” pile for several weeks. I haven’t used this fry pan in years, one reason being is that it is missing the little metal circle that enables you to set it at a particular temperature. 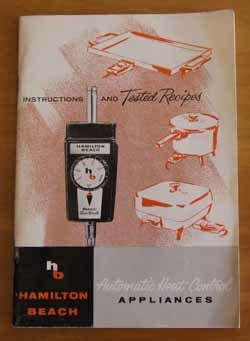 Then I found this instruction/recipe booklet: Hamilton Beach Automatic Heat Control Appliances. (Is is one of the “ccok books” listed in my database.) That inspired me to give this appliance one last meal to cook for us! I carry the fry pan upstairs and wash off the dust and cobwebs. The bottom of the bottom has a small layer of burned-on fat, but I don’t bother scrubbing it off. The top looks like it is water-spotted, but it doesn’t clean up with an SOS pad. This US patent was granted in 1961 to G. E. Sorenson for an “Electrically heated device with plug-in thermostat”. (Patent page.) The timing makes sense; I acquired this fry pan about 1969-71. I remember my college roommate making sukiyaki in it. The booklet tells me that the plug-in thermostat also works with a griddle and a saucepan (I had neither). I decide to make “Chicken Tetrazzini” on page 42 of the booklet. But how am I going to set the temperature? Hmmm. There is a photo of the dial on the cover of the booklet. Maybe if I scan it? Okay – now I’ll print the above and cut it out and tape it to the thermostat. Cool, it works! I’m ready to make the tetrazzini. I will make a half-recipe. Instead of American cheese, I will use regular cheddar cheese. For cooked peas, I will use frozen peas, straight from the bag. Elbow macaroni – !!! – none in my pantry! I don’t feel like driving back to town, so I substitute whole-grain cavatelli. I did pick up pimientos yesterday – I was surprised to find them canned at Sprouts. Pimientos are less prevalent these days than they were in the 1970s. I usually substitute red bell peppers. According to Wikipedia, a pimiento is a chili pepper that is smaller and a bit more sweet and succulent and aromatic than a bell pepper. 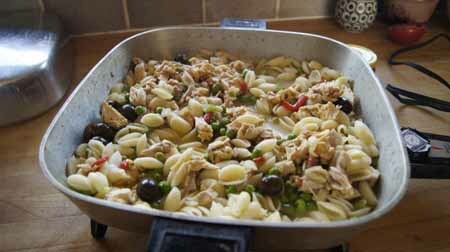 Below is my version of Chicken Tetrazzini. I used the electric fry pan, but any stove-top pan could be used. Cook the bacon in a skillet or sauce pan. (I used the electric fry pan set at 325˚.) When the bacon is crisp, add the onion and green pepper and stir until softened. Lower the heat and add the pimientos, chicken, peas, almonds, chicken broth, and cheese. Cover and cook for about 15 minutes. If the mixture gets too dry, add a bit more chicken broth. Meanwhile, cook the macaroni in salted boiling water. Drain, then add to the chicken mixture. Lightly mix and heat. If you like, add a few olives and some parsley. Serve! We both liked this! It’s tasty and easy. I’ll keep my electric fry pan. It would be good for the Stylish Meat Balls I made last week, because it is a large pan and maintains a low heat setting. I’m sure I’ll find other uses now that I have rediscovered it. 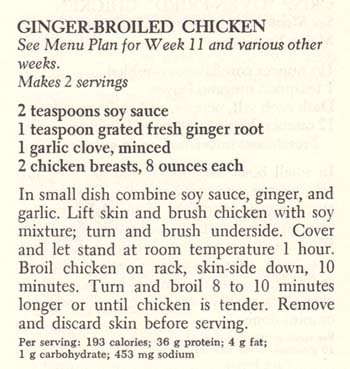 If my eyes fall upon the bottle of hoisin sauce in my refrigerator, I think of Moo Shoo Turkey and get a hankering to make this for dinner. Moo Shoo Turkey is really just a stir fry in a flour tortilla, why do I like it so much? Dunno. I included it on the short list of main dishes in my 1990s blog, and I still make it today, in 2013. I am not sure where I got the original recipe, must have been from a magazine or newspaper. 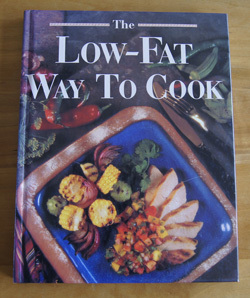 It is low-fat, and tasty. It takes a little while to pull together the ingredients, so I won’t say it’s really “simple”. But it’s worth it. Hoisin sauce is a “sweet and garlicky bean sauce” (Cook’s Thesaurus). I find that different brands taste quite different. I have found it at the Asian Seafood Market, Safeway, and Whole Foods (my current brand). It’s essential for this dish. I sprouted mung beans to make the bean sprouts for this dish. Why? Because I could. Also, I often find that supermarket bean sprouts (1) come only in a large package and (2) are often slimy by the time I go to use them. If you are in Boulder, though, you can drop by the Asian Seafood Market and buy just the right amount of very fresh bean sprouts, as she sells them in bulk. Stir fry the garlic, ginger, and carrot for a couple minutes on medium-high heat (use as little oil as possible). Then add 2 tablespoons of water to the pan, cover, and cook for 1 minute. 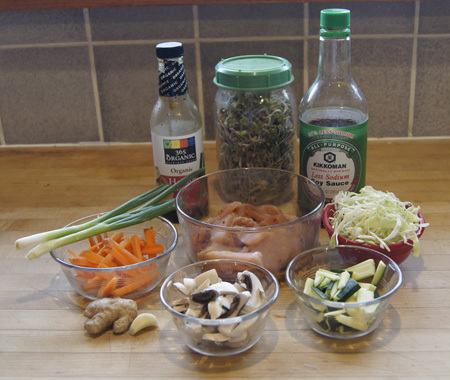 Uncover the pan and add the cabbage, zucchini, mushrooms, and the 1 tablespoon soy sauce. Cook a few minutes, until the vegetables soften. Then remove the vegetable mixture from the pan and set it aside in a bowl. Add the turkey with its marinade and cook until the turkey turns white and liquid is slightly reduced. This will take 5-10 minutes. Add the vegetable mixture back to the turkey mixture in the pan and add the bean sprouts too. Heat through – just a couple minutes. Sometimes I thicken this mixture with 1-2 tablespoons cornstarch mixed with 1/4 cup water. 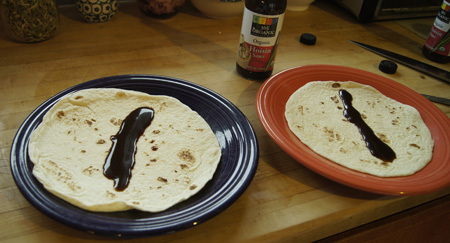 Spread flour tortillas with 1-2 tablespoons hoisin sauce each. Microwave them a few seconds to heat and soften, then add the turkey-vegetable mixture and some chopped green onions. Serve immediately. This looks kind of lonely on the plate. I often serve it with Chinese-style stir fried rice. Lonely or not, Moo Shoo Turkey was great once again! I clipped this recipe back in the 80s from the Colorado Daily, the campus newspaper of the University of Colorado, Boulder. Me, a seasoned cook, using a recipe from a campus newspaper, a resource that targets the 18-24 year old crowd! But this is a great dish for families too. I included it on the short list of main dishes in my 1990s blog, and I still make it today, in 2013. It is simple, low-fat, and tasty. The original recipe suggested serving with grilled or broiled green, red, and yellow bell peppers. 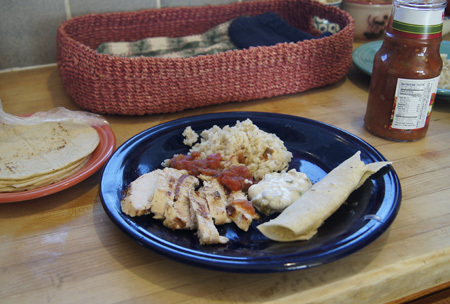 Instead, I always serve it with a good, chunky salsa, rice, and warmed corn tortillas. I generally start this in the morning and let the chicken marinade all day, but a couple hours is sufficient. Combine the yogurt, onions, chilies, cumin, and salt. Remove about 2/3 cup of this mixture, mix it with the tablespoon of mayonnaise, and set it in the refrigerator for later use (it’s a sauce for the cooked chicken). Put the rest of the yogurt mixture in a bowl and add the chicken pieces. You can make the chicken extra tender by piercing it a lot with a sharp fork. 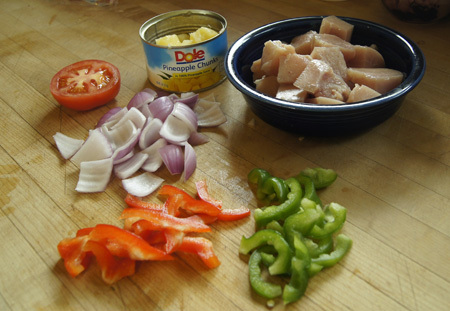 Cover the bowl and set the chicken-marinade mixture in the refrigerator. The chicken is done when an instant-read thermometer reads about 165˚. If you don’t have a thermometer, check for doneness by cutting into one of the pieces with a knife (it should no longer be pink inside). Slice the chicken into 1/2″ thick pieces and plate it with the cooked rice. Sprinkle with chopped cilantro if you wish. Serve it with the reserved yogurt mixture and hot salsa. 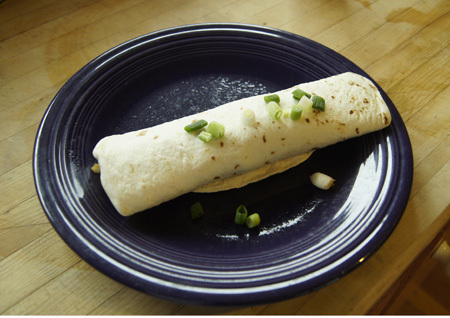 Warmed corn tortillas make a great addition! 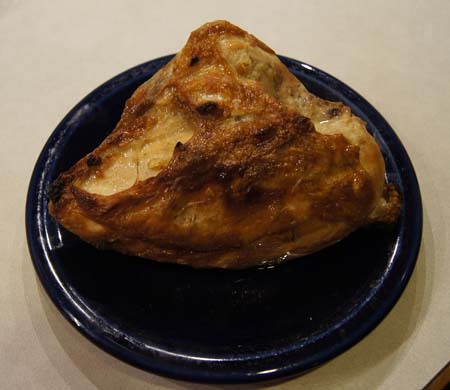 This recipe became part of my repertoire in 2006. I combined a recipe clipped from a magazine and class notes from the Mediterranean cooking class that I took at the Culinary School of the Rockies (now Escoffier). Input from my daughter’s Moroccan boyfriend and his family helped too. The recipe is now fine-tuned and tested enough to share. I have to tame down the olives and saffron to suit my dining partner; I’m giving options for those (like me) who love these ingredients. A “tagine” is basically a stew. It gets its name from tagine, a traditional pot with origins in North Africa. 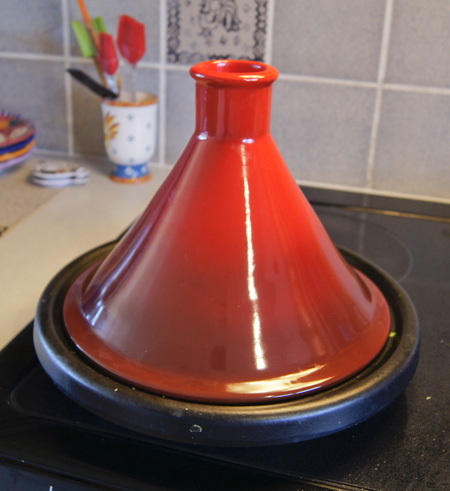 A tagine is a flat cooking dish with a lid that has tall, sloping sides. It is meant for long, slow cooking of meats, allowing time for the meat to tenderize, while the cooking liquid constantly condenses on the lid and drops back into the pot. Authentic tagines are earthenware and colorful. I would have loved for my daughter to bring me one home from her travels, but they are a little too big to fit in a backpack. Instead, I purchased a westernized one made by LeCreuset. It has a cast iron base (good for browning meats) and a stoneware lid. My tagine recipe can be cooked just as well in any heavy, lidded stove top pan, or baked in the oven in a stove-top-to-oven casserole. When we made a lamb tagine in cooking class, we cooked it both ways, and none of us could tell a difference. About the olives. My first choice are the big, green “Greek” olives, probably from a market’s open deli section. Do not use the bottled “Spanish olives” used for martinis. Do not use stuffed olives. Greek olives might be called Ionian, Nafplion, or “cracked green”. (Here’s the Cooks Thesaurus reference on olives.) You can use kalamata olives; these are smaller and purplish-black, but they are almost as good in this dish, and are good jarred, so you don’t have to make a special trip to the store. The original recipe called for 2 cups of olives; I cut this down to 1/2 cup so that I could serve it to my dining partner. I’ll usually add more to my own serving, although they are best cooked into the sauce, as they help thicken the dish. About the “preserved lemons”. This is a Moroccan specialty. They are difficult to find in local stores, but are pretty easy to make. I was given some at my cooking class, and later by some Moroccan friends. But I’ve substituted plain lemons as in the recipe below and find they work fine (at least for this non-connoisseur). This serves about 4-5 people. It can easily be cut in half for 2-3 people. Cook onions in a small amount of olive oil until they wilt, salting to sweat, then add the garlic and stir for 30 seconds. Add the chicken and stir for several minutes, then add the cilantro, parsley, cumin, ginger, paprika, saffron, pepper, potatoes, and stock. Simmer, covered, about an hour. (Or, bake in a 350˚ oven, covered, for an hour.) Add olives, lemon juice, and lemon peel. Slowly and with stirring, add the cornstarch and water. Simmer a few minutes until it thickens. Taste and adjust seasonings. Sprinkle with a little chopped fresh cilantro and parsley and serve over couscous or rice. This is one of my new comfort foods! Cookbook #18: The Electric Slow Cooker Cookbook. Barbara Bean, Henry Regnery Company, Chicago, Illinois, 1975. I have eleven crock pot/slow cooker cookbooks – guess that says something! Three are copyright 1975. Let’s see, where were we then. We moved to Colorado in 1973, so we were living in Boulder. I was in my first years as a working young woman, and interested in the current healthy-style trends. I used the crock pot to cook beans or inexpensive cuts of meat while I was at work (or at play, thinking back …). Crock pots (as we know them) had not yet been invented when I grew up. Out of curiosity, I google-searched news articles employing date limits and found the first mention of “crock pot” in 1973. A “crock pot” was demonstrated at a church gathering by a “Mrs. Fred Jones”, and a bride-elect was presented with “an electric crock pot and a lily corsage accented with red roses”. A more traditional search of the web pulled up a Wikipedia entry and another interesting website that discuss the history of the electric crock pot. 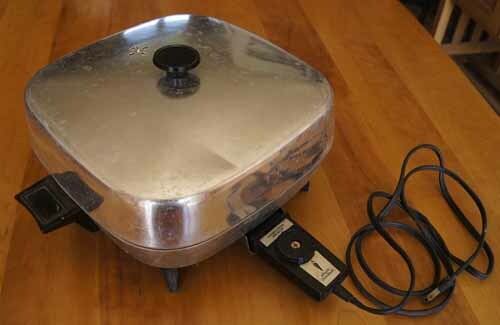 Its predecessor was the “Naxon Beanery All-Purpose Cooker” developed by the Naxon Utilities Corporation of Chicago. In 1970, Rival bought Naxon and the rights to the Beanery, upgraded the appliance, and called it the Crock-Pot®. The PetitChef website has a graphic of crock pots from different eras. My first one looked just like the “1971” version. My use of a crock pot has ebbed and flowed over the years. I tried a lot of recipes; some failed, some worked. I used to use the crock pot a lot for my own version of refried beans. I would buy dry pinto beans, soak them, then cook them in the crock pot with a bunch of seasonings. When done, I would mash them with an electric hand mixer while still in the pot. This way, I would have “refried” beans without any fat. In the early 70s, I also cooked soy beans for a soy bean chile. I consider a slow cooker an essential tool for my kitchen, even if it sometimes sits for months without use. I’m now on my third slow cooker. My first one was a Rival CrockPot® (it got a crack in it), my second one was a “Crock Watcher” by Hamilton Beach (it has a removable crock; the switch wore out). My newest has a timer and a removable cooking crock. Recently, I had a lot of fun using it to make Apple Butter. The best thing about a crock pot meal? Walking into the kitchen after a long day day at work or play, and finding the house suffused with the aroma of something delicious simmering and ready to be dished up. What I don’t like about the crock pot is that with the wrong recipe, it can turn a mixture of meat, vegetables, and liquid into an amorphous mass. I’ve learned to choose my recipes carefully. It’s good for breaking down tough, inexpensive cuts of meat, like round steak or chuck roast, turning them into tender and tasty stews and stroganoffs (try it for my Lamb Stew with Cinnamon). 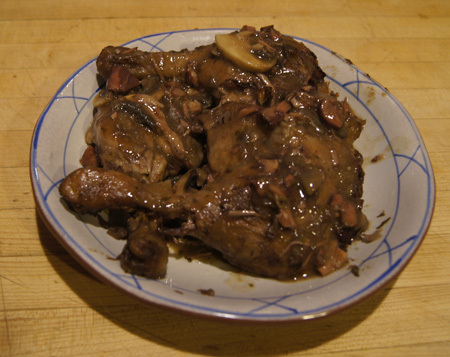 I have a good recipe for game hens in a slow-cooker and a great cassoulet recipe. I’m sure I’ll come across other crock pot favorites when I go through the rest of my cookbooks, and I’ll share those that have become favorites. And, I’ll try to branch out as I go through these eleven crock pot cookbooks. And I am branching out with my recipe choice from this cookbook: Duck! Yes, duck. That other poultry. We’ve had it at restaurants a few times but I’ve only cooked it once or twice. So trying this recipe is a bit of a stretch for me. Good exercise! 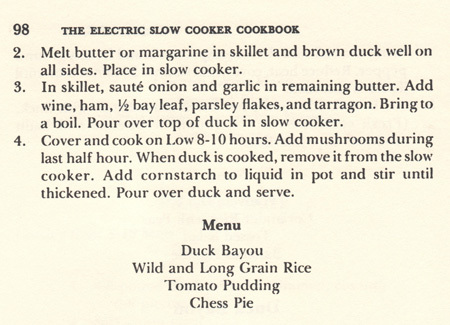 The duck recipe is not the only recipe that I might eventually try out of this cookbook. I noted about six that look interesting. Years ago, I tried the recipe for Teriyaki Chicken and wrote notes on it. 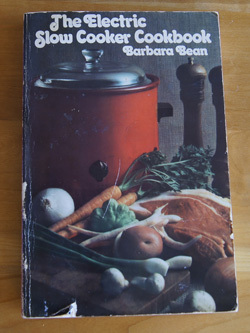 The recipes in this 1975 cookbook are a bit dated, perhaps, but I think they stand the test of time as “comfort foods”. One would not see their simple titles on a recipe in a fancy restaurant, but in my kitchen, after a cold winter day spent outdoors in the Colorado high country? Yes, they have their place. I am going to keep this cookbook. You can see from the photo (at the top of this entry) that it is well-worn. 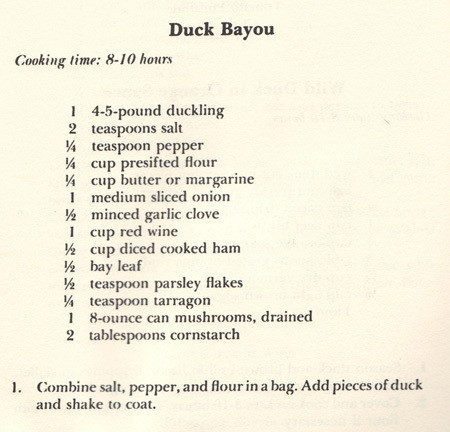 The recipe I will try is “Duck Bayou”. I think that duck will hold up well in the slow cooker; it probably will retain some texture after a long cook. And it has a distinct flavor to bring to the dish. The dish turned out to be a success. I probably will cook it again, and I think it’s interesting enough to share. I did run into some issues, though, both at the store and in the cooking. First, duck can be hard to find. I was lucky to find three leg-thigh pieces at the counter at our local groovy store. They had frozen whole (and expensive) ducks in the freezer display, but I’m cooking for two, and that was too much; I didn’t want to cook an entire duck for two people. I wrote the following recipe for two people, and if you have more to serve, buy a whole duck and cut it into pieces yourself. Second, the recipe said to cook for 8-10 hours on low. I checked my duck at 6 hours, and found that the liquid was almost evaporated and the duck was starting to char. I immediately removed the food from the cooker. The problem with the cooking time might be that the original recipe was written for a tall, round slow cooker. Mine is large and oval-shaped. Also, I downsized the recipe but still used a large slow cooker. Two approaches fix the problem: less cooking time and more liquid. I made a few other changes as I cooked this recipe: more herbs, chicken stock, extra wine added at last step, fresh mushrooms. My modifications are incorporated in the version below. This recipe is written for 2-3 people, depending on appetites. Double the recipe (using a whole duck) and it will serve 4-6 people. Carefully trim the fat and any excess skin from the duck pieces. Duck skin tends to pack a lot of fat. Combine the flour, salt, and pepper in a paper bag. Add pieces of duck and shake to coat. Put a small amount of oil (I used olive oil) or butter in a frying pan. Add the duck pieces and brown well on all sides. Place in slow cooker. In the same pan, saute the onion until it wilts, then add the garlic and saute 30 seconds. Add 3/4 cup wine, 1/2 cup stock (or water), ham, bay leaf, parsley, and tarragon. Bring to a boil. Pour over top of duck in slow cooker. Remove the duck from the slow cooker. Add 1/4 cup red wine to the cooker. 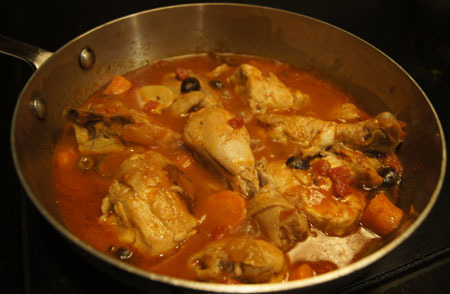 If there is only a small amount of sauce in the cooker, add some chicken stock until you have at least a cup of sauce. Add the mushrooms to the slow cooker and turn the heat to high. Cook about 10 minutes, until the mushrooms are done. Taste the sauce and add a bit more salt, pepper, tarragon, and/or parsley to taste. Dissolve the cornstarch in a small amount of water, then add to the sauce. Cook on high until the sauce thickens. Serve the duck with the sauce; rice is a good accompaniment. I served it over a white-brown-wild rice medley. Here is the cooked dish. The photo is here for proof that I actually cooked the recipe; it isn’t really very pretty. But it tasted good! I found this recipe somewhere in a magazine or newspaper way back when: meaning, before I started writing down where and when I got a recipe. It has stood the test of time; I still make it today and I made it when the kids were here too. This recipe is for four people, although now I halve the recipe for just the two of us. If you can’t find thin turkey breast cutlets, slice a whole breast horizontally. These are best when the crunch-to-juicy-turkey ratio is large. Today, I generally chop a fresh tomato or two for this dish, since I halve the recipe and who wants half a can of tomatoes leftover. I also use fresh thyme and basil to taste. If you keep the amount of frying oil low and don’t add more mozzarella cheese, this is a great low calorie meal. Cook the onion in a saucepan until it wilts, then add garlic and cook 30 seconds. Add the tomatoes and fresh or dried herbs to taste. Salt and pepper to taste. 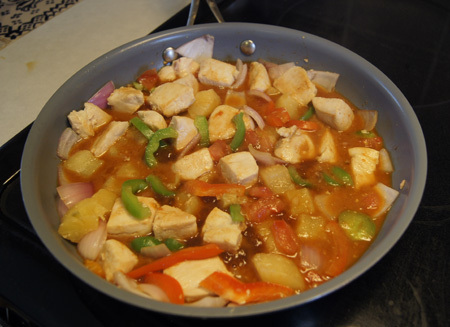 Let this mixture simmer at least twenty minutes while you prepare the turkey cutlets. Pound turkey cutlets to about 1/4″. If they spread out into huge pieces, cut them into smaller ones. Beat the egg white in one shallow bowl and put the bread crumbs in another shallow bowl. Shake some dry Italian seasoning mix and salt and pepper onto the bread crumbs and mix in. Slather the Dijon mustard over the pounded turkey cutlets. Then dip them in the egg white, then roll in the bread crumbs. Heat a non-stick pan until it feels nice and hot when you hold your hand an inch above it. Then drop in a little oil (olive oil is great) and spread it around. 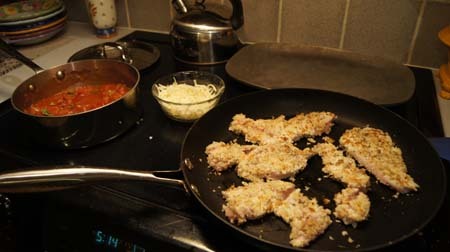 Add the breaded cutlets and cook 4-5 minutes on each side until golden. As they cook, heat the broiler in your oven. 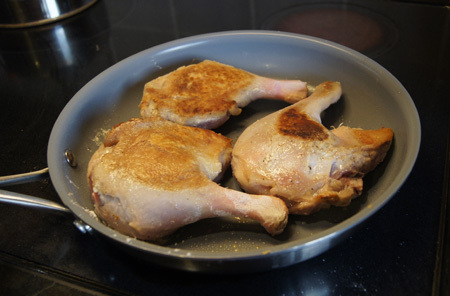 Remove the cutlets from the pan and place them on a baking sheet or broiler pan. Divide the grated mozzarella cheese among them, then put them under the broiler and watch carefully until the cheese melts. 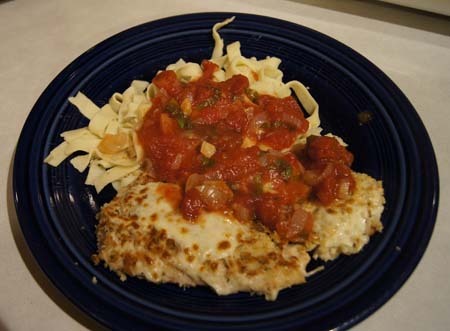 Plate the finished cutlets and spoon on some of the sauce. Cooked noodles are a great accompaniment, and a little fresh Parmesan doesn’t hurt! Here is the plated meal. I used my own homemade noodles, prepared in a big batch the week before and stored in the freezer. Making the agnolotti from the New Pasta Cookbook a few weeks ago really inspired me to get out my manual pasta maker more often and make my own noodles. 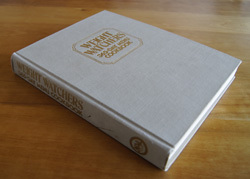 Something good has come from my travel through my 250 cookbooks!